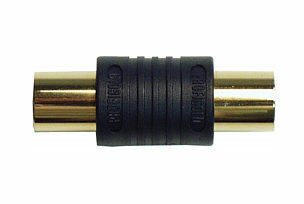 Profigold PGP2300 Male - Male Aerial Adapter, ideal for converting a male - female aerial cable to a male - male cable, or for joining two aerial cables together. This aerial coupler is ideal for converting a female aerial connector to a male. Pack of 3 high quality gold plated BNC to phono adapters. Ideal for converting bnc sockets to phono plugs. The USB-902 gender changer is used for converting a standard type A plug into a type B plug for use with devices such as USB printers, scanners etc. 3.5mm Stereo Plug to 2x 6.35mm Stereo Sockets Adapter. 2x 6.35mm stereo socket to 3.5mm stereo plug adapter. Nickel plated. 2x 1/4 inch stereo female sockets to 3.5mm male jack. Pack size 1.